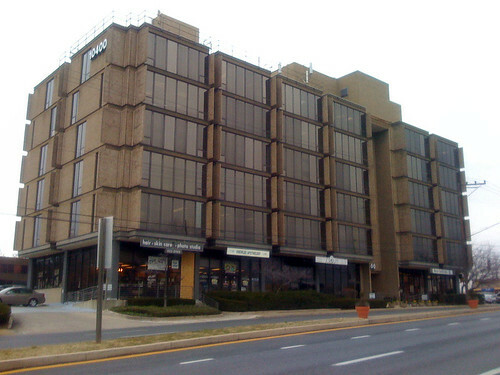 10400 Connecticut Avenue, one of several unloved buildings in Kensington's town center. Photo by Jomo on Flickr. For the past year, Kensington Town Councilmember Lydia Sullivan has been making fun of snobby suburbanites with Snoburbia, a T-shirt company and blog. But she's not laughing at plans to allow redevelopment along a stretch of Connecticut Avenue that's seen better days. Sullivan and some of her neighbors have written up a website, called KensingtonDevelopment.info, to oppose the Kensington Sector Plan, which is currently working its way through the Montgomery County Planning Department for a second time. Planners and town officials say it'll bring much-needed amenities to the area while making it more attractive, but Sullivan's concerned it'll allow too many apartments, ruining Kensington's "sense of place." “We are just battling for the soul of a place that *already* is different from the surrounding area," she writes in one of many e-mails we exchanged over the past month. 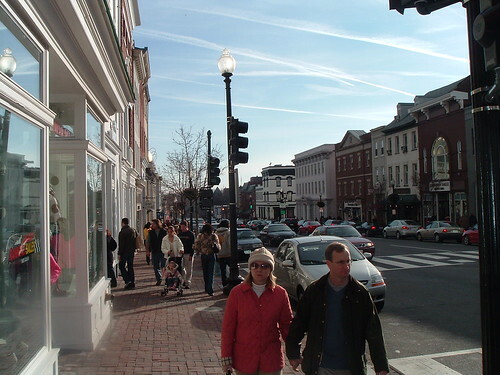 "Seriously, how many more generic, developerville town centers do we need in Montgomery County?" 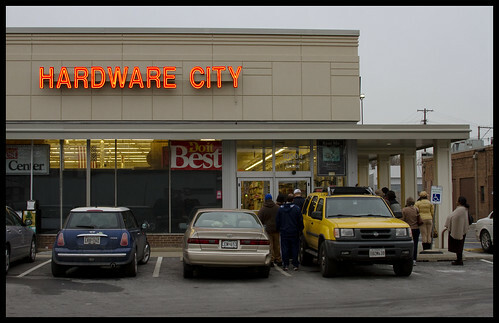 A local hardware store, located in a strip mall in Kensington. Photo by MoHotta18 on Flickr. The Sector Plan seeks to give Kensington something Sullivan says it already has: small-town character. They propose adding trees and wider sidewalks to Connecticut Avenue in the hopes of slowing cars down; by creating new parks and plazas were people can gather, and by using the new CR or Commercial-Residential zone, which will allow a mix of housing, shops and offices. Nonetheless, the plan’s been very controversial, particularly its allowance of taller buildings up to 75 feet on Connecticut Avenue and 45 feet on adjacent blocks. KensingtonDevelopment is especially concerned with the number of apartments that could be built. “Montgomery County wants density and more moderate-income housing in downcounty areas like Kensington. (But is this good for people in and near Kensington? )” asks one page. “For the first time in many decades, developers could build apartment buildings in sought-after Kensington,” says another. “The Plan could add between 501 – 1,410 multi-family units to a historic, single-family Town,” reads the homepage. To Sullivan, who's lived in Kensington for 18 years, the town is "Mayberry," she says, where its "tone of small-town friendliness" has been unchanged for over a century. In an e-mail, she told me a story about running errands with her 11-year-old son one Saturday morning. “I was out maybe an hour – and saw 10 people I knew – because that is what it is like to live here,” she writes, adding that she doesn't "expect me to understand." View Larger MapThe intersection of Connecticut Avenue and University Boulevard in Kensington. Actually visiting Kensington, meanwhile, tells a different story. The century-old railroad town, laid out by Brainard Warner in the 1890's and named for a fashionable district in London, has become one of the most sought-after suburbs in Greater Washington. Yet in the 1950's, two state highways, Connecticut Avenue and University Boulevard, were rammed through the town, bringing with them a mess of strip malls and office buildings that's started to look quite shabby. Though both roads see thousands of people each day, they're a distraction from the gorgeous, intact Victorian homes that sit just a block away. You can see it in the pictures people take of Kensington: search for "kensington md" on Flickr and you'll find pictures of the Mormon Temple, not of the town's adorable Antique Row. The Planning Department held a a photo contest for Kensington residents to find what they liked about their community, and almost all of them are of kids or flowers. Mayor Pete Fosselman, who supports the Sector Plan, is eager to see the Connecticut Avenue corridor fixed up. "With our six gas stations and now a pawn shop, zero night life, lack of pedestrian connections, automobile dependent state, deficient open space, and no architectural oversight, Kensington is due for a makeover," he writes in an e-mail to JUTP. Fosselman has the support of other councilmembers, local businesses, and town residents, who say Sullivan's part of a "vocal minority". Think about some of the places that are revered, that have been for many years. Think: Georgetown, Rhinebeck, Telluride, Santa Barbara, Athens, Burlington and many others like them. They don’t need “mixed use town centers” or manufactured “green space” and "pocket parks." We don’t know why, but we feel at home in these places. We walk on uneven sidewalks. We walk by imperfect windows filled with objects arranged (without a chart!) by local owners who know their customers. The downtowns were built slowly, over time, by locals. That's not the whole story, however. Places like Georgetown were built over time, but they’re also very dense, urban places. Georgetown has a street grid. It’s easy and pleasant to walk there. There are shops and offices, apartments and mansions, 19th-century factories and 21st-century embassies, all mixed together. You can live there if you’re a student or a Kennedy. This community formed because people live close together. But the urban form also allowed Georgetown to weather two hundred years of social and economic changes. Georgetown isn't just the way it is because it was built over time. It's a dense, urban, walkable place as well. Kensington's had over a hundred years to age, but it lacks the urban form, the density, or the diversity of a Georgetown. Sullivan doesn’t like “generic developervilles” like Downtown Silver Spring or Bethesda Row, but they’re a lot closer to Georgetown than Kensington is. Beyond the chain stores and new buildings are all of the things that Georgetown teaches us about how to make a unique, pleasant place. They put lots of people and activity in a small area. 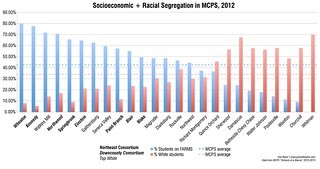 They mix different classes and incomes as much as possible. And they, too, have grown over time. Silver Spring has been an urban center for nearly a century, and tall buildings have been sprouting up since the 1960's. Allowing development in Kensington won't automatically turn the town into a lifestyle center. But restricting development will keep out the people and activities that could make Kensington an even more unique and interesting place. Even if everything that gets built in Kensington under the Sector Plan isn’t affordably priced (and not all of it will be), adding supply will still make it cheaper than it is now to live or work there. 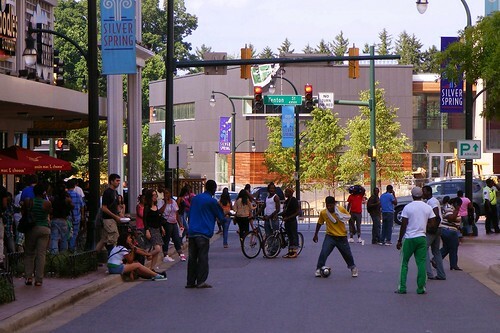 Creating a plan for Kensington won't automatically turn it into a lifestyle center. If anything, it lets people already living and working in the community invest there rather than being forced to go somewhere else. Kensington today is a prohibitively expensive place to live. A search on real estate website HomesDatabase reveals three houses for sale in the town today, ranging in price from $489,000 to $959,000. KensingtonDevelopment points out that homes in the town sell for "an average of $150,000 to $200,000 more than equivalent houses" elsewhere, while a Post article on Snoburbia says Sullivan's own house is assessed at $675,000. She tells me the town already has “200+ moderately priced apartments” in a 1960’s-era high-rise just across the town line called Kensington House. But rents there range from $1220 for a studio to $1725 for three bedrooms, placing them out of reach for many working-class people. This is a "generic developerville"? Again: girl, please. These people are being pushed out of Kensington already by high housing prices due to a lack of supply there and throughout Montgomery County. Sullivan has an ideal of small-town life, but the version she wants is inherently exclusive. For Fosselman, the costs of not doing anything are much higher. “If we simply “spruce” up the Town and go for status quo, Kensington will continue to deteriorate as other communities around us rejuvenate,” he writes. A great place is always changing. If Lydia Sullivan really wants to preserve Kensington's "sense of place," she should let the town grow as it naturally would. You said "Though both roads see thousands of people each day, they're a distraction from the gorgeous, intact Victorian homes that sit just a block away." Therein lies the problem. How do you add all the proposed density and tall buildings without destroying those "gorgeous, intact Victorian homes" or at least destroying the environment around them? Kensington remains a desirable area and isn't declining. The proposed plan is a solution in search of a problem. It's funny that after not checking on your blog for a long time (sorry), you'd have a post concerning my neck of the woods. I grew up right near Kensington, and aside from my college years, have lived here all my life. I don't plan on staying for much longer. Young people like me are more than welcoming to new development in Kensington. As far as I'm concerned, the areas going to waste, because it's nothing but antique shops. A few shops like this are fine, but a whole row of them (as well as Howard Street to the west of Connecticut, which could be mistaken for a hilly street in Detroit) is too much. Get rid of all the gas stations and redundant shopping, make the area more pleasant to walk in, don't overdo it with the green space, and don't do it all in a day. Who you calling a girl? To Robert's point, the Victorians in Kensington would be preserved like they are in Georgetown, it's Connecticut Avenue that needs some help. Mortis Olaf's got it right. And good job calling out the snob. I live in Kensington (in a top-secret, very affordable apartment) and am all for this plan. It's so frustrating being surrounded by a cute town, but not having much here to actually DO. I think that when a place has stayed the same to the extent that Kensington has for so many years, there might be a good reason for it. Many of the people that live there now seem to like it that way. I lived in Kensington until I was almost eleven years old and I now drive through there several days a week on my way to the Beltway or the western part of DC. I remember Kensington back when Connecticut Avenue ended at University Blvd. Where Connecticut Avenue now runs past my old elementary school there used to be woods that we would sneak down to during recess. My family shopped at the Kensington Safeway, the Kensington Pharmacy, and the general store which was so old that it had wooden floors. The building next door where we went to see the doctor is still there too, although I think it's an antique store now. My dad always went to Mizell Lumber or Hardware City. For excitement we went to Wheaton, for ice cream, the Hot Shoppes, the movie theater, and of course Wheaton Plaza, which was an actual plaza before they enclosed it. It was a fun place to go shopping. 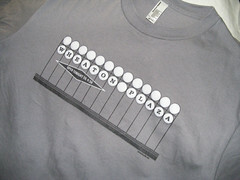 So Wheaton was like the big exciting next town over from our little hometown. I love the fact that almost everything in Kensington is still almost as it was - those two little shopping centers on Connecticut and University look pretty much the same as they did when I was growing up. Kind of junky, but that's how they've always looked. Kensington still has that small town feel, and there are small town things to do there - they have a community theater, they hold dances in the armory (my husband played a gig there just this past weekend), and they even have parades and little festivals. I know that's not terribly exciting, but Bethesda and DTSS are not very far away for more "urban" style activities. The roads have obviously gotten much bigger and busier than they were when I was a kid, and that situation is probably not going to change or improve with a new town center. It might get worse. If it brings in more residents, it seems likely that it will also bring in more traffic. It's a main route for people who need to drive to the Beltway and that's probably not going to change. Although my opinion is obviously tainted by a huge amount of childhood sentiment, it seems to me that the types of improvements that they are proposing for Kensington would be much more useful in the areas surrounding the two nearby Metro stations - Wheaton and Glenmont. It's likely that if the powers-that-be were able to figure out how to make Wheaton more attractive to the residents of nearby Kensington it might stand a chance of becoming as successful as downtown Silver Spring is now. Then the people who live in Kensington, specifically because they like the way it is, could keep their small town thing going and still have a convenient place nearby to go for restaurants and entertainment. I have to admit, the most exciting thing that has happened to Kensington in my young memory has been the recent Chipotle addition. Probably the most upsetting addition is the speed cameras, though I guess for the residents its a great thing that people slow down and don't hit their children. I digress. Kensington is quaint and boring, but beautiful. I don't see why everyone in this day and age feels that every town has to be a "DESTINATION" Why can't Kensington just be a place where people rest their heads and clear their heads? Hello...Wheaton is only about 2 miles away. I say leave Kensington alone and let Wheaton and Silver Spring build a trillion apartment highrises and foreign themed restaurants. I think what's missing in this discussion is the difference between what's proposed in Kensington and what's being proposed/built in Silver Spring, Wheaton, or Bethesda. The other three have tall buildings. In each of those places, there are blocks zoned for 200' tall buildings. In Kensington, the limit would be 75' - which actually isn't different from what's currently on the ground now. Kensington wouldn't be the next Silver Spring. But it would have things that any neighborhood or town center should have - like walkable streets, public spaces, and a mix of different uses. Just because it's not at a Metro station doesn't mean you can't have those things. After all, people could still drive to Kensington and want to walk around when they get there. You can't really do that now. If you really think that protesting against possibly doubling a town's population; putting in generic chain stores and restaurants with no character; and building upwards in a low-rise town of single-family homes means someone is a snob-- but I don't think you mean that. Are you really saying that fighting to keep a quiet small town quiet and small somehow puts Sullivan and her allies on the Dark Side?! Developers are always keen to tout the benefits of development. Teenagers are always bored, whether they live in Kensington or London. Projects like the one you seem to be cheering on will make Kensington just another suburban suburb, instead of the genuine small town it is now. Down with the plan I say. By the way, the way such a major change to the town was to have been sneaked by the residents is really sleazy. Let's make it clear: Kensington being a small town is perfectly fine and there's nothing wrong with that. But there is something wrong about having a nice, quaint, small town with a giant suburban collector road and strip malls running through the middle of it AND saying that "this is how things are supposed to be." No one is saying that there's anything wrong with knowing the town butcher. But I do think it's faulty to keep conditions as they currently are, especially when people have identified things they'd like to change. Even Lydia Sullivan's said there are good things about the Sector Plan - even if she says they'll make Kensington "inauthentic," which isn't true. Kensington is not a small town, it's right outside of The District of Columbia. Anyone who thinks otherwise is delusional. I don;t say that lightly, but it's not reality based to suggest that Kensington is anything other than a suburb of DC. How many people of these people that live in "small-town Kensington" actually work in Kensington? If it's not a suburb -- which it is many times over -- people wouldn't be commuting to Bethesda, DC, Silver Spring, Arlington, Alexandria, etc, etc, etc to actually work. Every area that close to DC needs to add some density and walkability. That's what younger generations want. It's also the only way to keep the DC region from sprawling endlessly into the horizon. It's also safer, cheaper and healthier. And trust me, proposals like this will make Kensington a better place. There will be more places to work, live, shop and play. Home values will go way up. More public transportation will come to the area. If done correctly, car traffic should decrease, making the experience more pleasurable for everyone. I've been to smalltown America, and trust me, it's not a few miles outside of a major city. One last point: All areas are always in flux. Areas never stay the same. Kensington wasn't like this 20 years ago. It was different 50 years ago. It was different 100 years ago. And it will be different 10 years from now. Every town, city, suburb, wild place, etc is always in flux. Will it really be so wise to keep Kensington so hopelessly car dependent when gas hits $5 a gallon? $10 a gallon? Of course by then most reasonable residents will just get up and leave for places that saw the trend lines years before. Small town America these days means a stretch of fast food chains and a Wal-Mart. The plan sounds solid. The historic properties will stay preserved since the development is all concentrated on the big roads. At least that's what I've gathered. If the local businesses are smart, they'll compete with the endless drones of new chains as they have with the current CVS, Safeway w/ Starbucks, various gas stations, Dunkin' Donuts, Baskin Robbins, and the THREE 7-11's within a mile of each other. Concentrating people won't create more car traffic since it's being concentrated with other uses, reducing the need for car trips. That's how towns and cities work.